The parent stock for this breeding project were imported between 2002 & 2004. The group currently consists of 2 males and 3 females, all of which are unrelated.. The largest female is 9.5" and produced her first clutch of eggs in 2004. 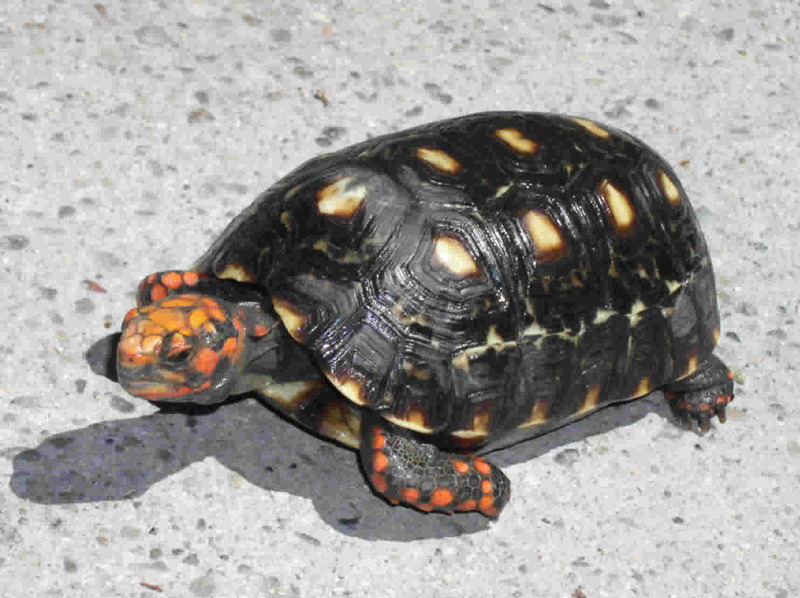 This particular variety of Redfoot Tortoise is a relatively small morph and could be considered a dwarf variety compared to some of the larger varieties such as those from Bolivia. The have all of the friendly personality traits of the other Redfoots but they are easier to maintain since they don't get as large. Their shells are basically black although new growth on their shells often comes in looking mottled or calico looking. Some wild imported "captive bred" animals show considerable amounts of this calico look. We plan to raise up a few babies to see if the calico looks is more related to diet than genetics. Our animals were selected for bright red heads and legs so their offspring should be spectacular!